Heat oil in heavy large skillet over medium-high heat. Add shallot, garlic and red pepper; sauté until soft, about 2 minutes. Add stock, reduce by ½. 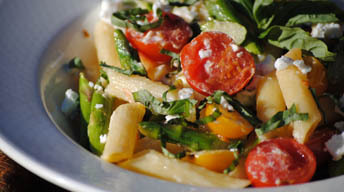 Add asparagus cook 1 minute then add cherry tomatoes, cook 1 more minute Season with salt and pepper. Remove from heat. Meanwhile, cook pasta in large pot of boiling salted water until tender but still firm to the bite. Drain. Transfer to large bowl. Pour sauce over pasta. Add cheeses, and 1/4 cup chopped basil. Toss to coat. Season with salt and pepper.